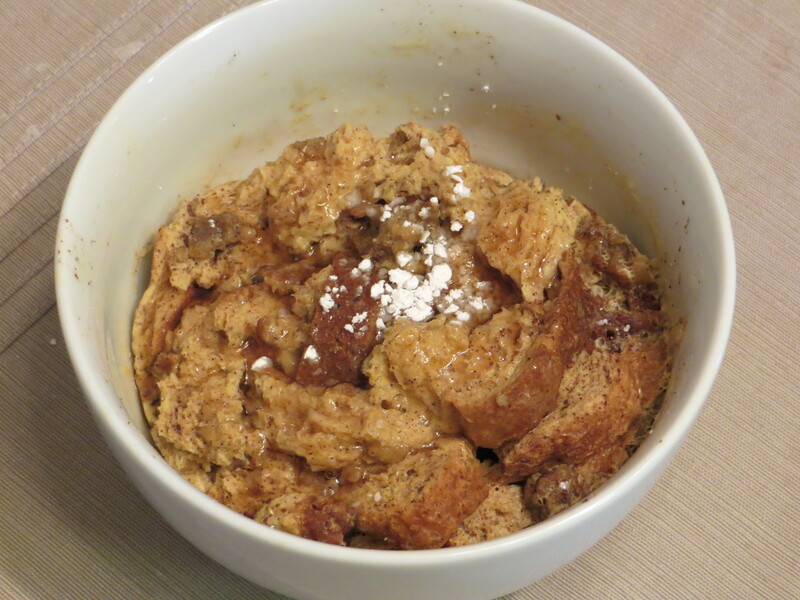 Have you ever chosen a recipe that you strongly suspected would be a dud, but you went ahead and made it anyway? That was me and the Pasta, Bacon & Roasted Pepper Frittata recipe from the WeightWatchers One Pot Cookbook. I have had a strange fascination with this recipe from my first perusal of the cookbook. 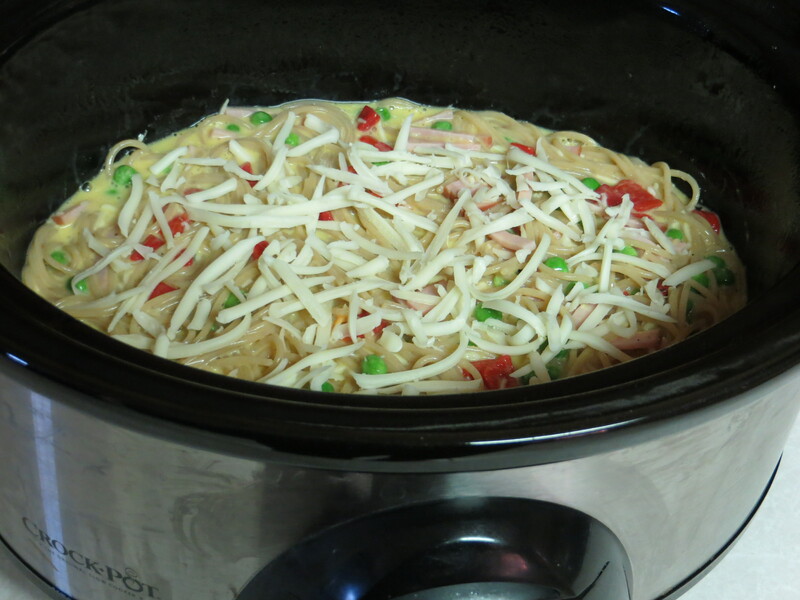 A frittata…in a slow cooker? Weird. Yet I could neither forget about it nor fully commit to making it. Each time I stumbled upon the frittata recipe in my cookbook, I’d remember how much I did/didn’t want to try it. So when I settled on slow cooker recipes for my January cooking challenge, I knew right away that January–for better or worse–would not end without me making this frittata. I had planned to make the recipe last weekend, but instead John and I bought a house. Well, made an offer on a house (which was accepted). The purchase won’t be final until next month. So…this weekend I once again planned to cook the frittata, this time for our Sunday lunch. I quickly ascertained that two hours may have been too long, as the edges had not just browned but blackened and turned rather crisp. It took a knife to pry the edges of the frittata from the ceramic insert. The spaghetti made for an interesting-looking dish, for sure. When cutting the frittata into four pieces, a honeycomb effect was visible where the spaghetti strands had been cut crosswise. My husband, John, appeared slightly scared when presented with his lunch. 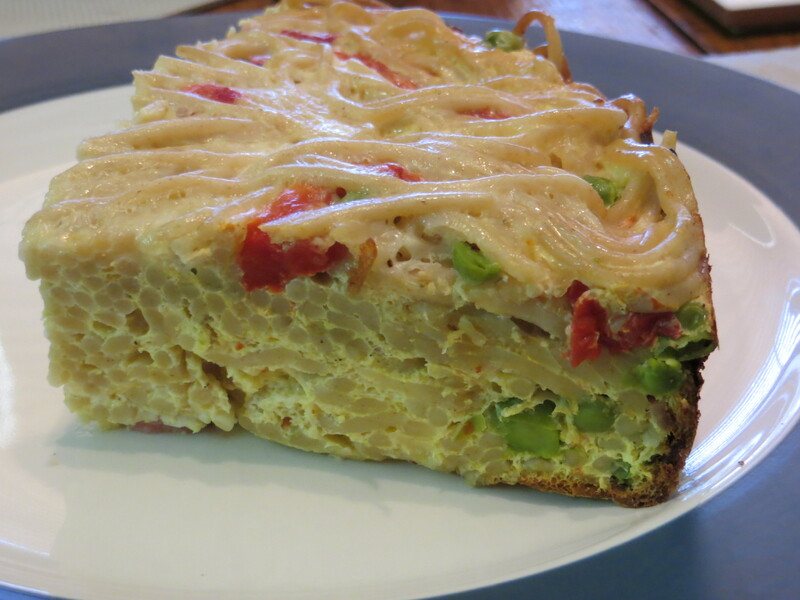 Upon tasting the frittata, my first thought was, “chicken spaghetti.” It lacked the smooth creaminess of chicken spaghetti, but the pasta taste in the frittata was very strong due to the sheer amount of it. Four cups is a lot of spaghetti. I rather liked the frittata through my first few bites, but my enthusiasm waned as I ate through my serving. By the end, it just tasted too dry to really enjoy. 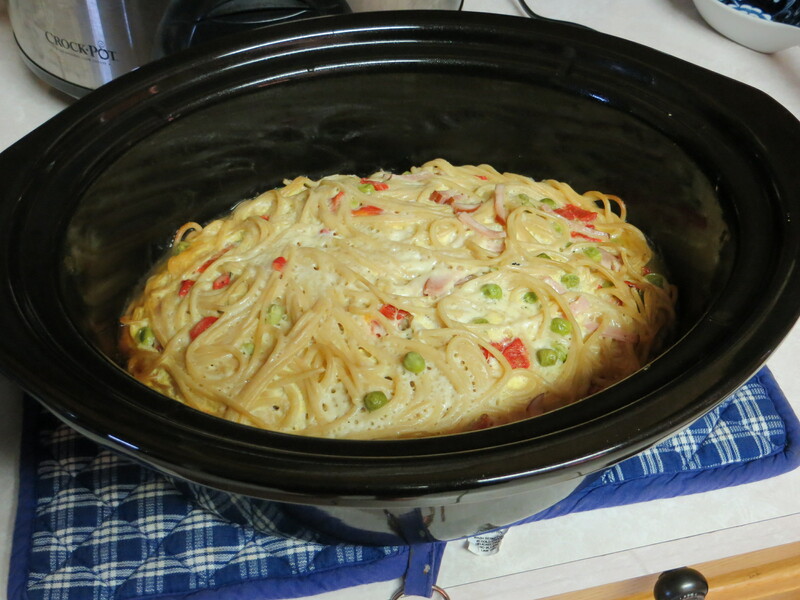 John thought more cheese, less spaghetti, and slightly less cooking time might yield better results. He gave the frittata 2 stars. I agreed on his recipe suggestions, but I granted the frittata 2.5 stars. I liked it somewhat better than last week’s disappointing turkey chili. There are just two weeks left to see if I can top the delicious Balsamic Pork Tenderloin, my tastiest slow cooker recipe this month. 1. Whisk together the egg substitute, Parmesan, and black pepper in large bowl. Stir in peas, bacon, and roasted pepper. Add spaghetti, stirring to combine. 2. Generously spray ceramic insert of 5- or 6-quart slow cooker with nonstick spray. Pour in egg mixture, making sure pasta is submerged. Sprinkle mozzarella over egg mixture, leaving 1-inch border all around to prevent frittata from sticking. Cover and cook until knife inserted into center of frittata comes out clean, about 2 hours on high. 3. Remove lid and lift out ceramic insert; let stand 15 minutes. With rubber spatula, loosen edges of frittata. Cut into 4 pieces. Serve hot, warm, or at room temperature. Yield: 4 servings. Per serving, 6 PointsPlus.